불상을 모시기 위해 나무나 돌, 쇠 등을 깎아 일반적인 건축물보다 작은 규모로 만든 것을 불감(佛龕)이라고 한다. 불감은 그 안에 모신 불상의 양식뿐만 아니라, 당시의 건축 양식을 함께 살필 수 있는 중요한 자료가 된다. 이 작품은 높이 18㎝의 작은 불감으로, 청동으로 불감과 불상을 만들고 그 위에 금칠을 하였다. 불감 내부를 살펴보면 난간을 두른 사각형의 기단 위에 본존불과 양 옆에 보살상이 있으며, 그 위에 기둥과 지붕으로 된 뚜껑이 덮혀 있다. 법당 모양의 뚜껑에는 앞면과 양쪽에 커다란 창문이 있어서 안에 모셔진 불상을 잘 볼 수 있도록 하였다. 본존불은 얼굴이 추상적이고, 양 어깨를 감싸고 있는 옷은 주름을 간략한 선으로 표현했다. 몸 뒤편에 있는 광배(光背)는 머리광배와 몸광배로 나누어져 있으며, 불꽃무늬로 가장자리를 장식하고 있다. 본존불 양 옆의 보살상도 구슬로 장식된 관(冠)을 쓰고 있다는 점을 제외하면 형식이나 표현 수법이 본존불과 유사하다. 불감은 지금도 금색이 찬란하고 지붕에 녹청색이 남아 있는 등 전체적인 보존 상태가 양호하다. 본존불의 긴 허리, 불규칙하게 나타나는 옷주름, 그리고 보살이 쓰고 있는 구슬로 장식한 관(冠) 등 여러 양식으로 보아 만든 시기는 중국 북방 계통의 영향을 받은 11∼12세기 경으로 추정된다. 이 작품은 고려시대 또는 그 이전의 목조건축 양식과 조각수법을 보여주는 귀중한 예라는 점에서 가치가 크다고 할 수 있다. 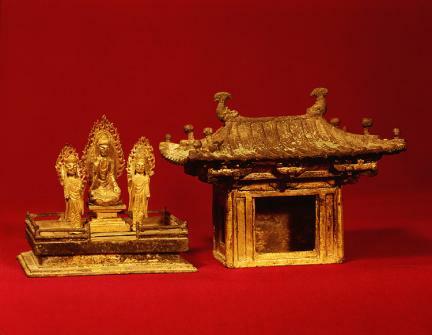 Korean Buddhists had a long tradition of carrying a portable shrine with Buddha images stored in it. The shrine of this type tended to feature the shape of a house built by carving wood, metal, or even stone. Today, it provides important clues about the Korean architectural styles in the past. 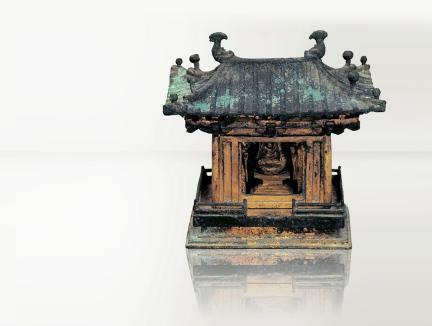 This particular shrine, 18 centimeters high and made of gilt-bronze, was made to treasure a tiny Buddha triad, also made of bronze and gilt. 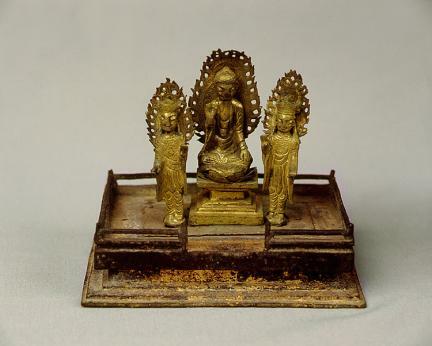 Originally placed on a rectangular altar with handrails in the shrine, the triad consists of the principal Buddha seated in the middle with two acolytes standing on either side. The shrine features the shape of a Buddhist prayer hall complete with columns, roof with ornaments, and three windows -- one in the front and the other two on both sides -- through which one can have a clear view of the sacred images enshrined in it. The principal Buddha is marked by a rather stylized face, with the dharma robe covering both shoulders and having folds expressed by simple lines; behind him are glorious head and body lights edged with flame patterns. The two bodhisattvas flanking the Buddha display stylistic and technical similarities, but they wear beaded ornamental headgears. The shrine is substantially preserved in original condition, still retaining the gilt walls and green-rusted roof. The Buddha’s long waist, robe folds expressed rather haphazardly, and beaded crowns worn by bodhisattvas suggest that the statuettes were made under the influence of the north of the Korean Peninsula in the 11th and 12th centuries. Today, the triad and the shrine provide valuable information on the traditional style of Korean architecture and carving techniques developed during or before the Goryeo Period (918-1392).